I heard a Master Gardener say she was hesitant to recommend that people plant avocado trees in their Southern California yards because avocados need a lot of water. Sounds sensible at first. We should be careful about our water use. But let’s think further. Unless you’re also going to stop eating avocados, then you haven’t automatically saved water just by not growing avocados in your own yard. You have merely paid an avocado farmer to use the required water to grow your avocados. Moreover, these avocados might be grown in a grove within walking distance of your yard. There are avocado groves all over the place, from San Diego County up through Santa Barbara County and even farther north. Your neighborhood avocado grove might even be using water from the same source as your yard (the local water district, for example). In this case, there’s absolutely no water saved; the only difference is who is using the water. So what if you decided to plant an avocado tree in your yard and grow your own avocados instead of paying a farmer to grow your avocados? How much water does an avocado tree actually need? And how many avocados would a tree give you for that amount of water? My experience in my Southern California yard as well as through observing many other trees in the region is that an avocado tree needs about as much water as a patch of grass that takes up the same amount of ground space. 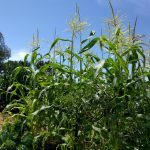 In other words, the water needed to keep a 100-square-foot patch of grass green in the summer could also keep a similarly sized avocado tree healthy and fruitful. Let’s use a tree with a 14-foot canopy as an example since I have one of those in the common Hass variety. In an average year, I’ve found that there is little to no irrigation needed from the month of December through March. But as you can see in the table, avocado trees need a lot of water through the summer. 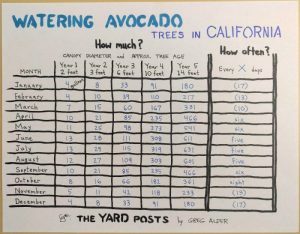 To be specific, I gave my 14-foot Hass avocado tree approximately 3,000 gallons over the course of the year 2017, which was not far from average in precipitation. The cost of water in my district of Southern California is $6.71 per hundred cubic feet, which equals $6.71 per 748 gallons. So I spent about four HCF, or almost $27 in water on that Hass avocado tree in 2017. 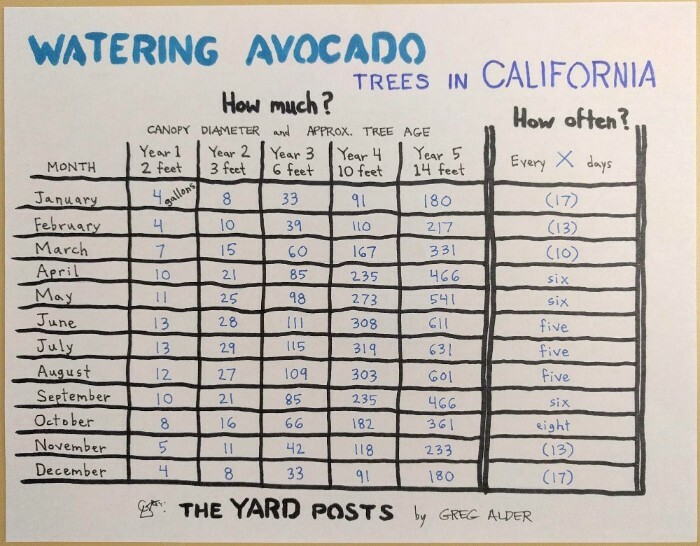 How many avocados will a tree give you? In 2017, that Hass avocado tree gave us 156 avocados. But the year before it gave us only 73. The crop is always different, but an average of the last two years is about the overall average, I’d guess. That would be 115, but just to be cautious let’s round down to 100. Average production: 100 avocados per year. At a water cost of $27 for a yield of 100 avocados, that’s 27 cents per avocado. My Hass avocado tree with 14-foot canopy that produces an average of about 100 fruit per year. Of course, there are some other costs involved in growing an avocado tree in your yard, but at least for my trees in my yard, after the original purchase of the tree, they’re almost zero compared to the cost of water. 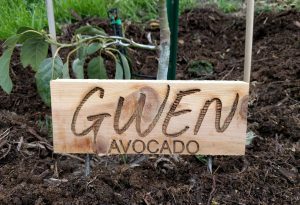 And in terms of the cost of water, growing your own avocado tree seems like the obvious right choice for anyone with a yard in a suitable climate, such as here in Southern California. I suspect your colleague was making a statement not about the cost of water in dollars, but rather some sort of social cost. I wonder if she has the same hesitation about buying avocados? Econtalk had an episode recently about water that was interesting. I suspect you’re right. But I took the opportunity to work through the numbers on the costs of growing your own avocados because I’d wanted to see what they were for a long time. The Econtalk on water was both informative and disappointing since it often morphed into fear-mongering. It reminded me of “peak oil” talk. What about the simple fact that we can all adjust our water use to align with reduced water resources? In Lesotho, it was simple to live on less than 10 gallons a day, and it’s within all of our abilities to adapt to using so much less if necessary. I’m not scared. Unfortunately, it’s too cold in the winter in Lesotho for avocados. The nearest areas where avocados can be grown are over the border in Natal or up in the Transvaal. At least you can grow excellent peaches in Lesotho! The peach tree at my house in Ts’oeneng was delicious. I live in the south west of Florida. 100 miles from Miami. I grew up in California and ate Hass Avacado’s as often as possible. Can I grow in a tree in my area? And if I understand correctly they need water, sunshine and warmth. We have all that here. I want to plant it where the legs will get vplenty of water especially during the summer rainy months. Thank you for any advice you will give. I know there are lots of people who grow avocados in Florida. I, however, am not one of them. So I can only tell you what I’ve read. And then if I had further questions, I’d ask the participants at Tropical Fruit Forum. There are a lot of Florida avocado growers who can help there. Ive enjoyed reading all your articles on avacados. I live in Carson CA, South Bay and would like to plant a Hass tree and a Eurika lemon tree next to each other, about 20-25 feet apart. Do you know if this would be problematic for either tree? Also how much sun per day do Hass trees need? In the summer its hot here 80-100f with lots of sun, but in winter only 4-5 hrs per day and only in the 70s. It so happens that my Hass tree is about 25 feet from an orange tree. They grow very well like that. A Hass and a lemon should too. A Hass tree in Carson would do best with all day sun, but will do fine with at least half a day’s sun. It will get uncomfortably hot for a Hass tree a couple times each summer in Carson, but as long as you water the tree well just before (yes, before) any heat waves all will be well except during record heat like last July. Same with cold in winter. Carson will only rarely get too cold for a Hass tree. You might want to be prepared to protect the baby tree during its first winter or two if there’s a record cold snap, but otherwise it will be fine down to about 30 degrees. I hope you get to plant your Hass and Eureka lemon, and I hope they do great for you! We actually intended to buy our first avocado tree on Saturday and changed our mind when the Employee said it needs to be watered 3-4 hours at a time. This article however may persuade us to think again. My other hesitation is based on my age and the first fruit. Haha! We live in Vista on a slope and eat avocados nearly everyday. I’d want to buy at least the 15 gallon. We saw one today at a nursery that was grafted with one fruit hanging. Does that mean it will bear fruit before 5 years? Thanks Greg. Really glad I found your blogs. They are perfect for a beginner gardener like me! It’s a no-brainer for you. 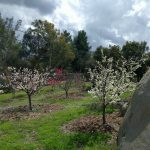 A slope in Vista is one of the best locations for avocados in Southern California; and if you eat avocados nearly every day, then you’ll both save money by growing them yourself plus you’ll appreciate that the quality of the fruit coming from your own tree is leaps and bounds better than what you can buy. Sorry the nursery employee misled you. Saying a tree needs to be watered for 3-4 hours at a time says nothing about how much actual water the tree needs. 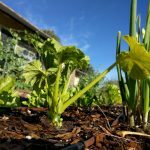 If you have a drip emitter putting out one gallon per hour, that’s 3-4 gallons. But if you have a sprinkler that puts out 25 gallons per hour, that’s 75-100 gallons. Gigantic difference. But be sure not to be deceived by the number of gallons per month an avocado tree needs. For example, a 10-foot tree in April needs around 200 gallons. That may sound like a lot until you remember a couple things. One, how many gallons did you use during your last April water bill? I bet it’s many thousands. Two, how much does 200 gallons cost? Not even $2 for most of us in Southern California. If you’re in a hurry to get fruit, a 15-gallon tree is the way to go, indeed. I often see 15-gallon trees in nurseries with fruit already on them, just like you did. Usually, a 15-gallon tree is about three years old, and that’s when many varieties start to fruit. 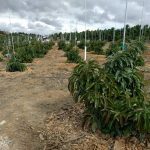 I do have a post about this: “How long until an avocado tree fruits?” In it there are some extra details and examples. 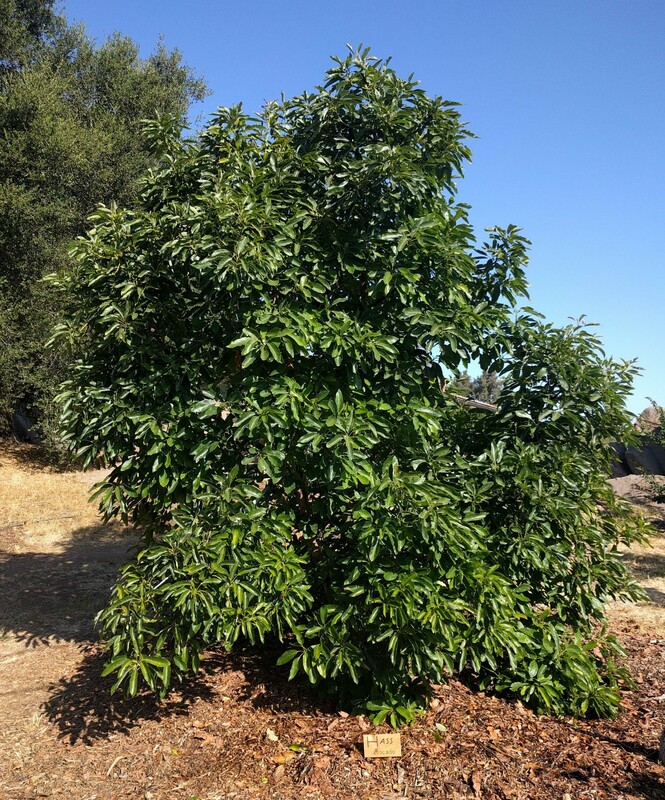 It’s hard to think of waiting years for a tree to produce fruit, but if you plant a 15-gallon Hass this spring you will almost certainly have a few avocados growing on it next year. The number of fruit grows exponentially every year thereafter. For example, my Hass that I planted as a 5-gallon waited until its fourth year to fruit, but then held 73. The next year, 156. What I mean to show is that even though an avocado tree takes a couple years to bear its first fruit, it quickly ramps up production to where it can be giving you more than a hundred fruit. Thanks for your reply Greg! Your advice definitely makes me want to go out and get one or two ASAP. And your articles and water costs have made my finance husband very relieved! Haha. Okay one more question I’m still unsure about. Can I assume that there are other Avo trees near me for pollination? I don’t think my neighbors in my street have any and I’m against an open canyon. I’ll buy two if necessary but really want to buy the right ones. Thanks again Greg! Having another avocado tree nearby isn’t very important except sometimes with certain varieties, such as Fuerte. If you’re thinking of a Hass, Reed, or Lamb, you can feel confident in planting a single tree and getting plenty of fruit. I wouldn’t recommend planting a lone Fuerte, however. That’s risky. That being said, having two trees close together always increases pollination. Trees in your neighbors’ yards are not nearly as useful for this as a second tree in your own yard within spitting distance of your other tree. Pairs of trees that go well together are Hass and Reed or Hass and Lamb. They’ll aid in pollination a bit, and the harvest seasons are different so you’ll have fruit to pick in more months of the year. If you’re thinking of any other varieties, let me know and I’ll give my thoughts. I was thinking of Reed and Haas. I like the idea of two with a longer season and better pollination odds. You’re so generous with sharing your information! Thanks Greg! Your post on avocado trees is very informative. In your opinion how much water should I be using to feed my tree. Canopy wise it streches out to a circumference of about 25 feet. The tree is probably close to 35 feet tall at the highest point. The tree is about 60 years old. I seldom water the tree directly, maybe once during the summer flooding water around the base for a couple of hours with the garden hose. It seems to be in decline of sorts. The fruit is smaller compared to when I first was introduce to the tree when I purchased the home 35 years ago. In a good fruit bearing year , I would harvest up to 500 avocados. I give my thanks to Mother Nature. 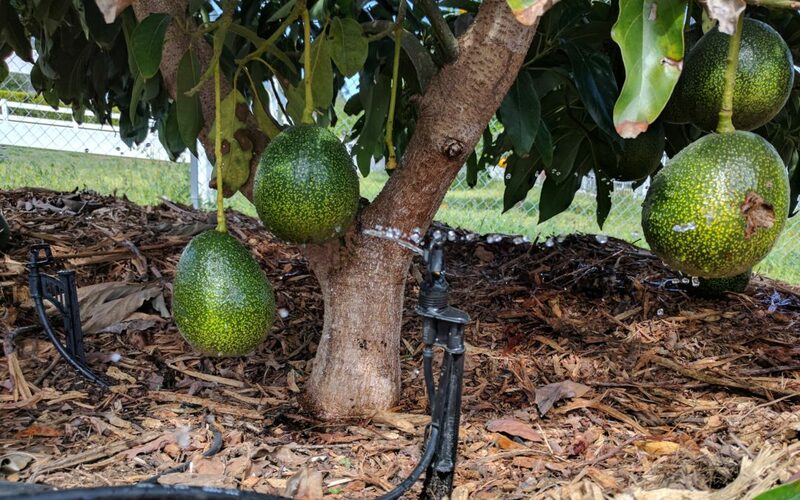 It’s really hard to say what amount of water needs to be given to such an old, established avocado tree because it is likely drinking from other irrigated areas in the yard. In general, with such trees you have to judge based on the appearance and performance of the tree. Since yours is declining you might think it needs more water but that won’t necessarily help.